James MacNaughton was born at 5 Raeburn Place, Edinburgh on 21st February 1838, the son of a shoe maker from Haddington and at the age of 14 in 1852, was apprenticed to John Dickson & Son at 63 Princes Street, Edinburgh. Upon the completion of his apprenticeship, he remained with Dickson for five years and then set up his own business in 1864 at 33 George Street staying at this address until 1869. During this period he took out his first patent, a slide and drop action in patent no. 1971 of 1867. In 1869 he moved to 26 Hanover Street the address that is always associated with MacNaughton in the 19th century. He had three sons, David born in 1871, Alan born in 1873 and Duncan born in 1876, all later entering the firm. 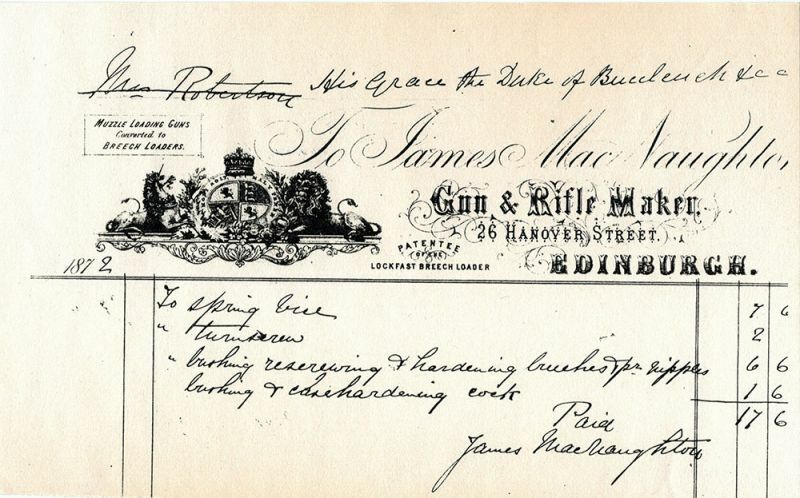 His business was considerable and in the 1881 Census, he is listed as employing 13 gunmakers. James MacNaughton was friendly with a gunmaker of German origin, Julius Coster and heard about trigger plate designs his father was making in his native Germany. Consequently, when he decided to venture into hammerless manufacture, he based his gun upon the trigger plate model to create something entirely different to the conventional sidelock. MacNaughton’s design was well thought out, simple, compact and strong with the action self-contained upon the trigger plate. This meant that the action bar could be well rounded as there was no mechanism in the way - a true round action thereby creating the classic Edinburgh round action so admired by many. The early guns were cocked by the top lever, but later guns used the more conventional barrel cocking mechanism. He gave his gun the name “The Edinburgh”. Compared to Dickson, MacNaughton favoured the bar-in-wood design, whereby the stock extended to enclose the base of the action, a design in Scotland known as a “skeleton action”. Such guns were difficult to stock but the end result was an extraordinarily elegant and handsome gun. The Field of 11th May 1907 commented “This is perhaps the most elegant gun of all the hammerless guns made. It is a most artistic gun, comfortable and light”. Compared to Dickson, MacNaughton did not make a great many round action guns with only 308 being recorded in the MacNaughton ledgers. James MacNaughton died on the 17th May 1905 although the business was continued by his sons. 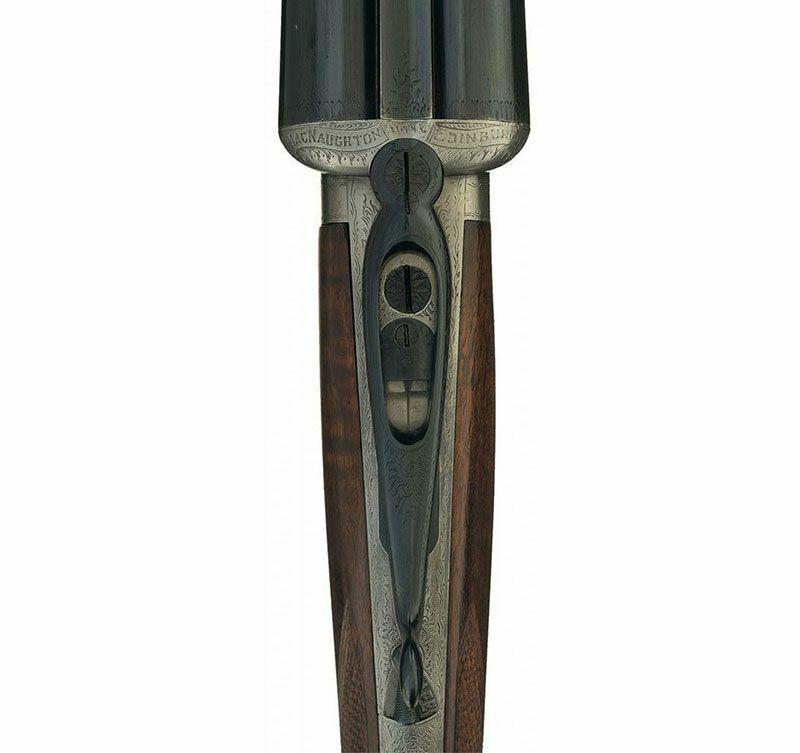 John Dickson & Son acquired the MacNaughton name in 1947 and continues to build the classic MacNaughton round action gun in bar-in-wood style.